Serenity at home. This indulgent home spa experience is designed to detoxify and refresh. Made with carefully selected ingredients that are available thanks to honey bees! Take good care of yourself with Serenity Spa Tower. Each and every Serenity Spa Tower comes with an inspirational message of wisdom, clarity, being grounded and having peace and strength.Maybe you find time to exercise a few times a week and experience a few aches and pains? Making time for yourself to rest, relax and reset is just as important for you. Care for yourself and find peace as you apply these wonderful products made by hand right here in the USA. 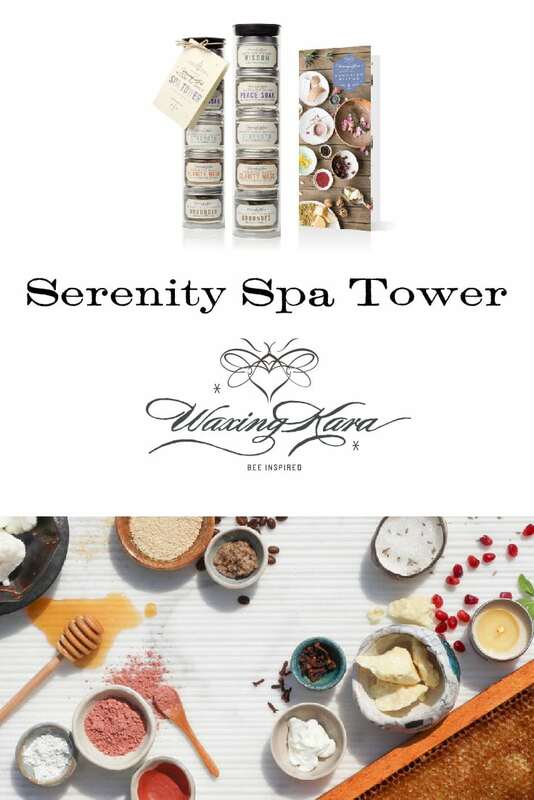 Pamper yourself with our Serenity Spa Tower®, a great gift for you or someone else you love. For men and women. Each Serenity Spa Tower is accompanied by a gift card for 10% off your next purchase. Limit one coupon per purchase. 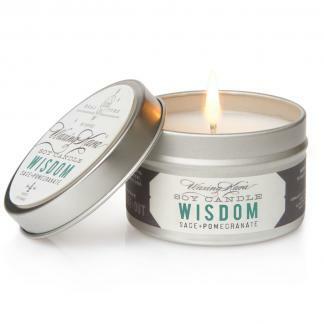 Wisdom Soy Candle: the scent of sage and pomegranate to warm the home. 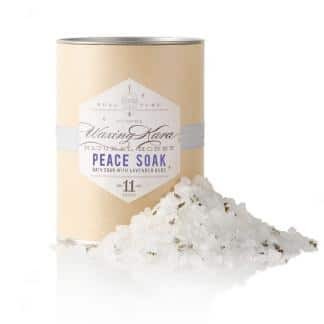 Peace Soak: a combination of epsom and dead sea salts and fresh-picked lavender buds from our farm ease sore muscles. Strength Honey Body Butter: powerfully awakening and deeply moisturizing. With clove, cinnamon and citrus. 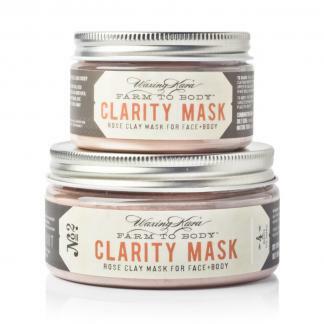 Clarity Mask: draw out impurities from the skin with rose clay from the earth. 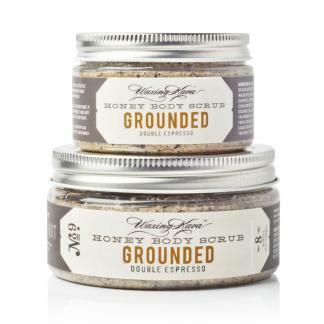 Grounded Honey Body Scrub: an invigorating scrub made with real coffee grounds and honey. Step 1 – Dry Brush the skin. 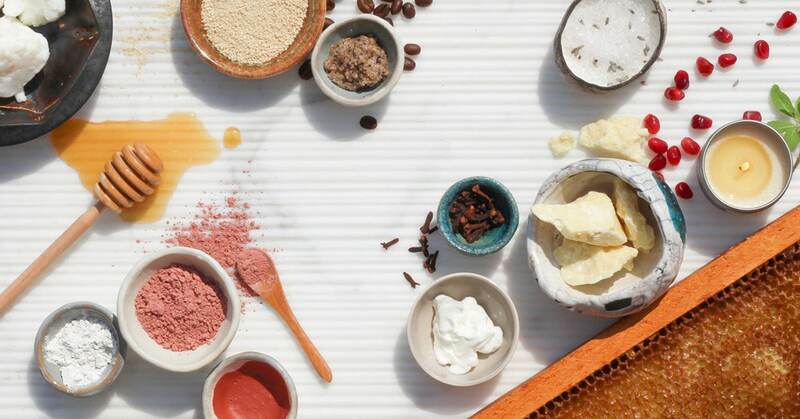 Exfoliate with our Honey Body Scrub. Apply the body scrub onto damp, cleansed skin in circular motion. Wash off and gently pat dry. Step 2 – Detoxify with our Dry Mask. Safe for use on face and body. Follow label directions to prepare the mask for your skin type by mixing with milk, yogurt, carrot juice, honey or just mix with water. Spread a thin layer on cleansed skin on face and body. Allow to dry. Rinse and gently pat dry. Step 3 – Soak with our Dead Sea Salts. Run hot water into a bath and pour salts under the running water until dissolved. Soak. Rinse with cool water. Step 4 – Smooth and moisturize dry, dull skin with our Body Butter. Spread body butter from décolletage to toes, leaving your skin ultra-moisturized for up to 24 hours. Step 5 – Relax: Pour a cup of herbal tea and sweeten with Honey. Light a candle. Listen to inspiring music. Relax your body and mind. This is such a great and inspirational gift. I sent one to my daughter to remind her to take care of herself. I gave this to my mother, she loved it. She was thrilled that she could use it more than one or two times plus she says she got a discount on a future purchase. That’s like a gift that keeps on giving! High quality products. This is an excellent value. Thank you. I have been dying to try a spa tower, and I’m glad I did! I thought it would be a good way to get a wider sampling of Waxing Kara products, and I was right. I really like the simple and clean nature of everything… actually, I guess it would be the Nature IN everything! I had my little candle going earlier, and it is so nice to have one burning and NOT end up with a headache. I enjoy a demure fragrance that does NOT scream its presence. (Things that smell like a chemical cardboard air freshener can just stay in the store- I’d rather huff gasoline… no thanks!!!) This candle, though, is delightful. Everything is. Thank you. Patricia, That was well-said. You ‘get us’ and we appreciate that. We want everyone to enjoy “the spa at home” Glad to hear from you! Patricia, What an awesome review! Thank you!